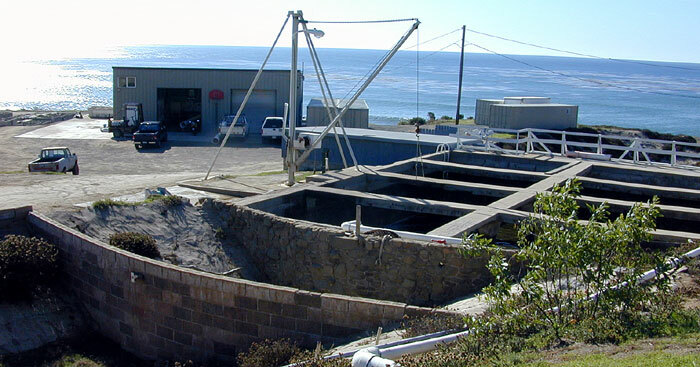 The Abalone Farm is the oldest abalone farm in California that produces red abalone (Haliotis rufescens)product. This farm started in 1968 on the central coast of California near Hearst Castle and the little town of Cayucos. 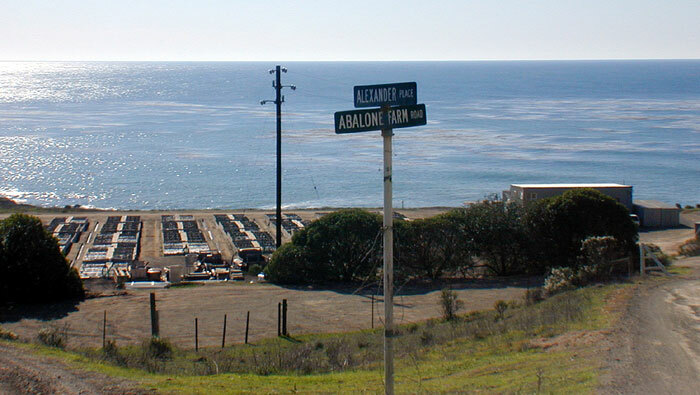 There are 15 or more abalone farms on the coast of California. 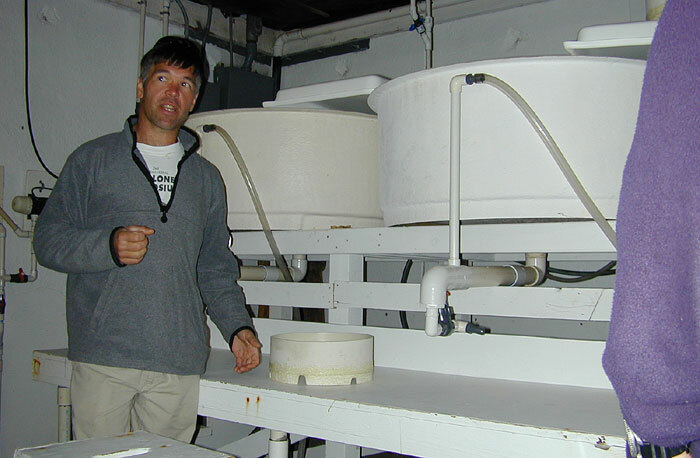 During November 2003 the author was given a tour of The Abalone Farm and permission given to take photographs to produce this lesson on a typical abalone mariculture farm. The Abalone Farm at Cauycos, California. 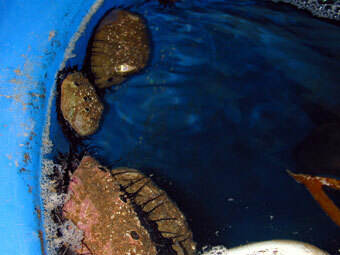 Abalone culture takes four to five years before a marketable product is ready. Right now the marketable product is either live abalone (3.5 to 4.5 inches across the shell) or vacuum packed abalone steaks (already tenderized and ready to be cooked). 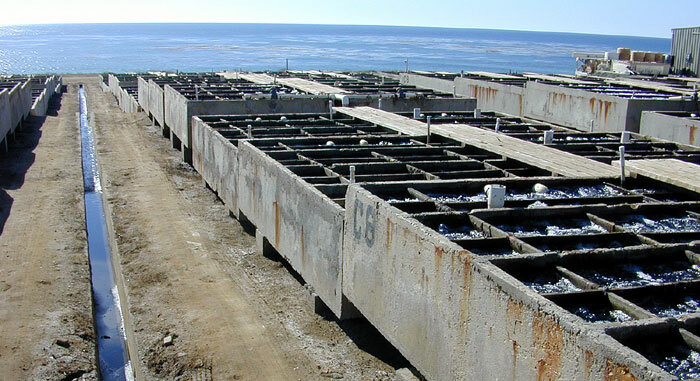 The abalone brood stock are kept in large tanks. The seawater is monitored to keep it cold, clean, and degassed. Adult male and female brood animals are kept specifically for spawning. 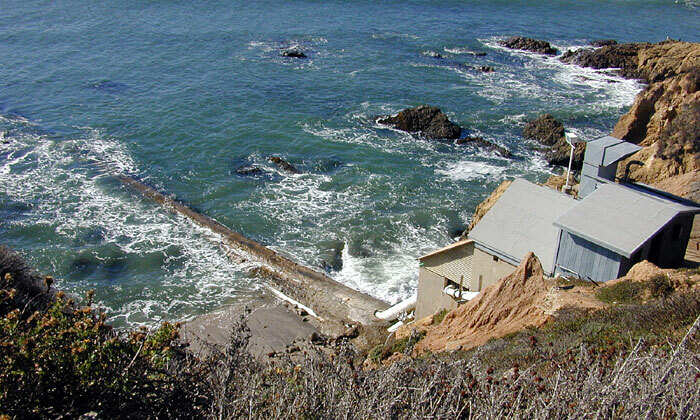 A large seawater intake pipe provides plenty of clean ocean water for The Abalone Farm. This pipe is 18 inches in diameter and extends into the Pacific Ocean in a rural area of the central coast of California. 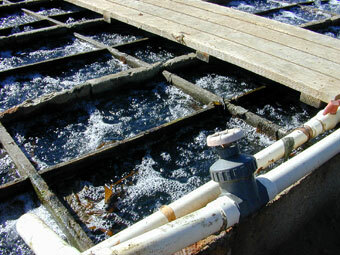 Over six million gallons of seawater is pumped through The Abalone Farm each day. The water quality is monitored and returned to the ocean. Large filters help to store seawater and maintain its good quality. A sterile spawning room is where the males and females are manipulated with hydrogen peroxide to release their gametes (eggs or sperm). 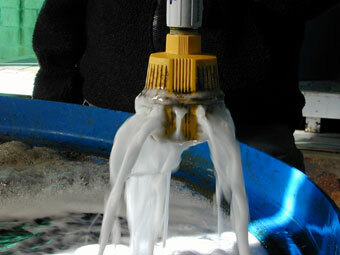 The eggs and sperm are mixed and the fertilized eggs allowed to develop into the veliger larval stage. After the veliger stage, these microscopic planktonic larvae settle and begin life as a bottom dwelling (benthic) abalone. At this time they begin to eat algae. 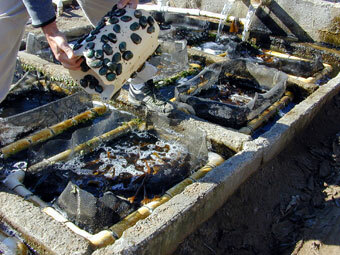 An indoor nursery is where the abalone spend their first six to eight months. Here they are fed algae in various forms until they reach a size of about a half of an inch. During this time the fastest growing individuals are favored and the slow growing individuals may be culled. 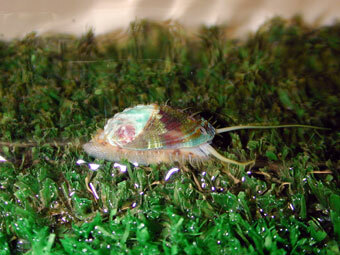 Artificial turf discourages the baby abalone from crawling out of the water and becoming stressed. At this stage the species of algae that they eat is often seen in the color of their shells. An algae called 'dulce' is often fed to the babies and results in a red shell. 'Dulce' is a species of red algae that has been found rather easy to culture and thus provides a good food source for the baby abalone when they are in their first first year. It's scientific name is Palmaria mollis. The babies are transferred to floating basket tanks for the next two years of their lives. 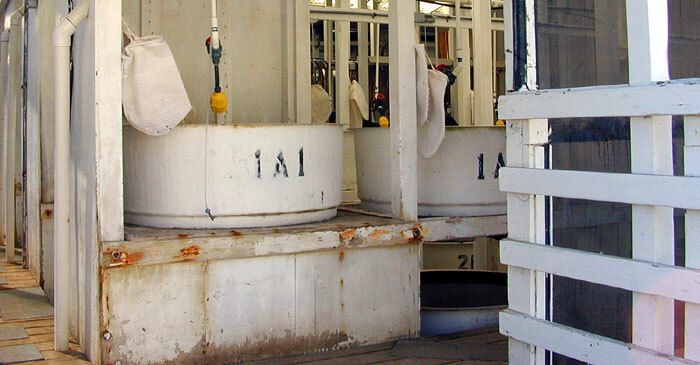 The floating baskets are kept in outdoor tanks and each is provided with areas of solid surface (the white plastic) for the baby abalone to crawl upon. 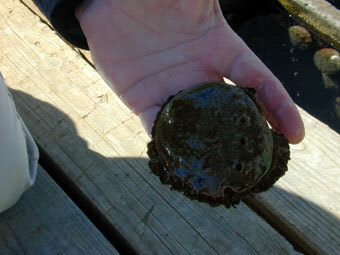 At the end of two years the baby abalone are about 1.5 to 2 inches across the shell. The abalone are fed kelp at this stage. Kelp is harvested from offshore natural kelp beds for this purpose. 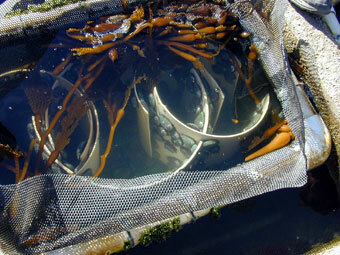 The Abalone Farm operates its own kelp cutter and brings in fresh kelp as needed to feed the growing abalone. The kelp is brought in fresh and dumped in pits at the farm. 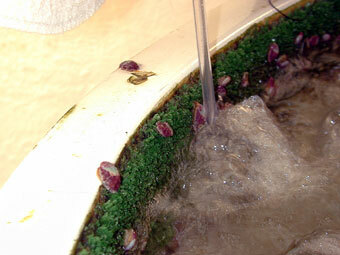 It is used almost immediately, in its fresh state, to feed the growing abalone. The Abalone Farm takes a keen interest in the health of the offshore kelp beds and works hard to maintain these natural resources so that they can remain as a natural food source for the growing abalone. 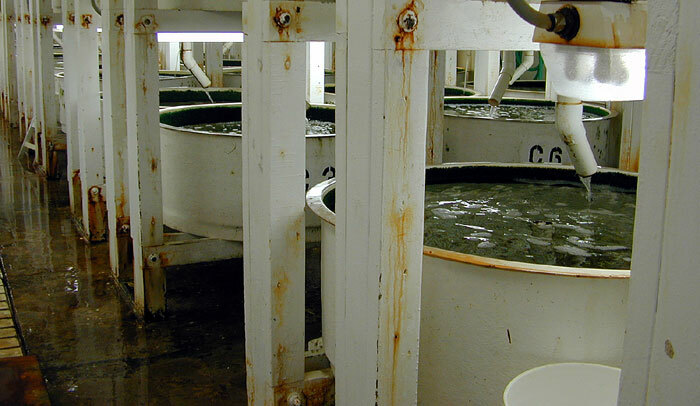 Grow-out tanks are the final stage in abalone mariculture. These outdoor tanks are the home of the maricultured abalone for the last two years of their life. They are fed kelp and are kept in cold, clean seawater circulating through the farm. When the abalone are 4-5 years old and 3.5 - 4.5 inches across they are harvested and sold as live abalone or as prepared steaks. Each steak is about an ounce and four make up one serving of a main course. The cost for prepared steaks is between $70 to over $100 per pound. Feel free to visit the website of The Abalone Farm at www.abalonefarm.com and view their product and recipes. This enterprise is one of several in California that now supplies the abalone sold in restaurants. A few abalone are taken by sport divers, above San Francisco Bay from April to June and from August to November but a special permit is needed. After the special permit is obtained divers in 2014 are restricted to three per day, skin diving only (no scuba gear), and animals that are 7 inches or larger in diameter. These rules will help keep the wild abalone relatively protected from water deeper than 20-30 feet (as most divers cannot hold their breath long enough to go deeper than this and get an abalone). At least this is the hope of the California State Department of Fish and Game, the agency responsible for the health of the wild abalone in California.